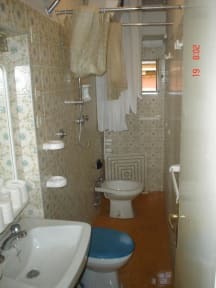 Rose Santamaria B&B i Rom, Italien : Boka nu! Please note that check-in takes place at the following address: Via Paolina, 20, at my cafe. Established in 1990, Rose Santa Maria has come to be one of the most popular accommodations in Rome and a well-known place to stay for young travelers. Since its opening it has been recommended in all the main guide books. The structure is located in Rione Monti, a lively neighborhood close to the Colosseum and the Roman Forum. Just down the hill you will find the charming cobble-stone streets, Monti proper, complete with fountain for nighttime gatherings. A trendy area, it boasts artisan and vintage shops, a plethora of dining options and cafes, and bustling crowds comprised of residents, artists, tourists, and other colorful folk. Rose Santa Maria is a calm, clean, budget-friendly place to crash in the heart of Rome. 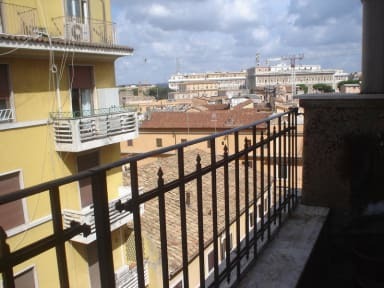 It is located on the fourth floor of a 19th-century close to Via Cavour, one of Rome’s main roads. Despite being a small property, with no common room and no kitchen, our guests appreciate the cozy, homey atmosphere. Several transport options, such as metro, buses, trams, taxi stands, and tour buses, are at your fingertips. Rose Santa Maria is easily accessible from Termini central train station, just a few minutes' walk from the structure. Termini hosts bus and train transport to and from Rome's airports. Thank you and enjoy Rome. Please read the Booking Conditions section carefully. It is advisable for guest under 45 years old. - A variety of shops, supermarkets, banks, laundromats and a variety of dining options nearby. - Close to ATM and money exchange. Monuments, museums, and most major attractions within walking distance. - International staff happy to assist with reasonable requests.